All his life, Shane Lassiter had revered the man who stood in place of the father he had never known. Nathaniel Wilcock had taken Shane into his own home, loved him as a son, and placed within his grasp one of the largest ranches in the Wyoming Territory. But Shane had heard the stories. He knew the whispers about the fugitive gunman who stood against Wilcock during the land wars that had rocked the valley almost thirty years ago. In Nathaniel Wilcock’s eyes, the gunman was nothing better than a vigilante and an outlaw, and as such he had died. To the people of Hangtree, he was a hero—a martyr who had stood against corrupt power and injustice. When Wilcock’s greed moves him against the only woman Shane has ever loved—a woman who holds the secret that could resurrect everything for which the outlaw fought—Shane finds himself forced into a place not so very different from that of the outlaw thirty years ago. He must make a decision, the shadow of which will forever be cast over the lives of all those he loves. A decision between truth and power—between honor and life—between right and wrong. One man stood up unafraid. One man’s courage became a legend. 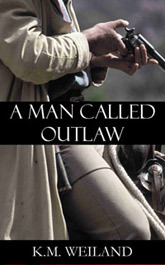 "The book is a fantastic read: a true, good old Western with bravery facing up to cowardry, and poetic beauty on each page. And suspense. Intrigue." "I must say it's been a long time since I've read a book that was so moving and so powerful as this book."